I have to admit, one of the things I find most annoying about the Aerogarden is that the grow bulbs seem to blow out on a regular basis, and worse, the only way to get replacements is to go to Aerogarden's store . Here's the problem--just one of these light bulbs easily cost upwards of $10-13. It's a clever way for Aerogarden to get themselves a regular source of revenue, sort of like the way Gillette never made money on its razors but on the razor blades. But for someone like me who wanted to get into indoor gardening partially to save money, it really doesn't make sense for me to be raving about how I save money by not buying fresh herbs, but end up paying triple the amount I would have paid in electricity and replacement bulbs. Here's how it works. 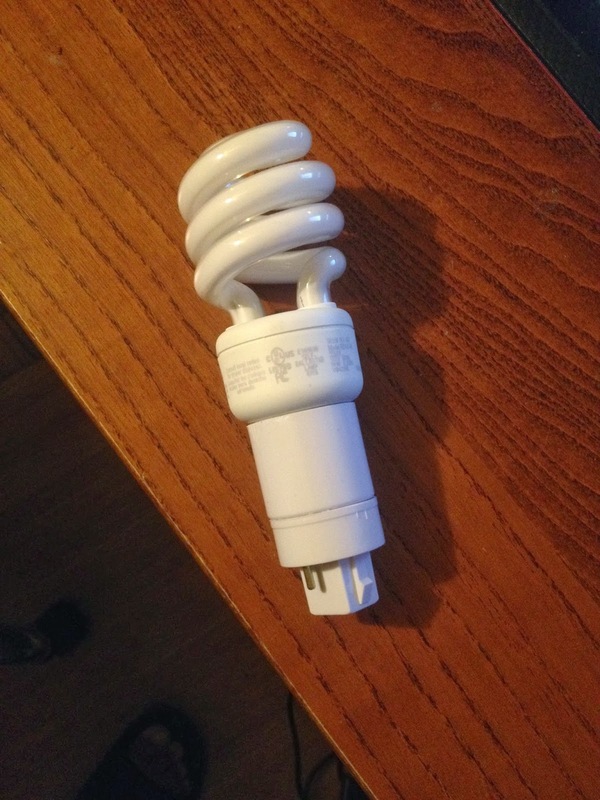 You take a regular CFL or LED light bulb, the same kind you use around the house, and screw it into the adapter. Then, you plug the adapter right into the Aerogarden. Note that certain light bulbs are going to be too big to fit, but the ones I happened to have lying around fit perfectly. 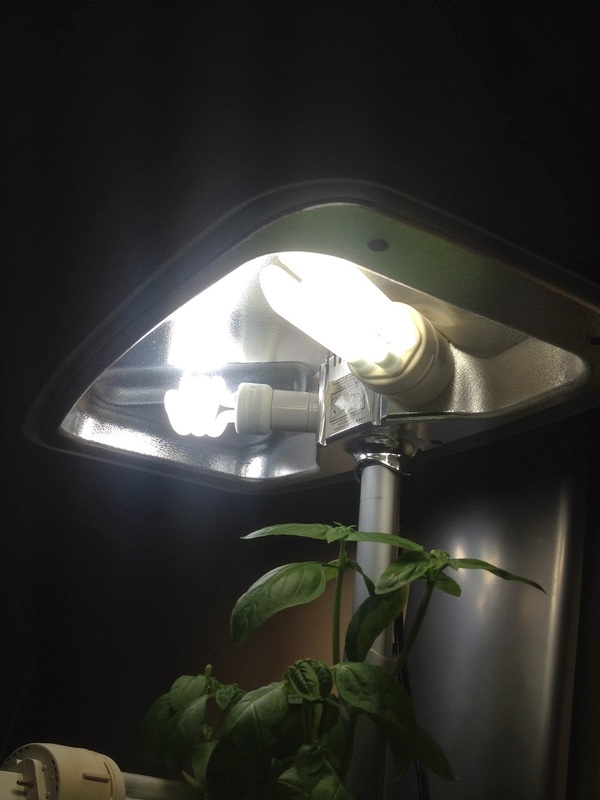 Voila--instead of shelling another $13 for a new light bulb from Aerogrow, I ended up using a $1.42 light bulb. While Aerogrow will tell you that its lights are "specially formulated to maximize growth", I haven't noticed any difference between the bright light that the Aerogarden grow light is putting out vs. the one that the regular light bulb is. 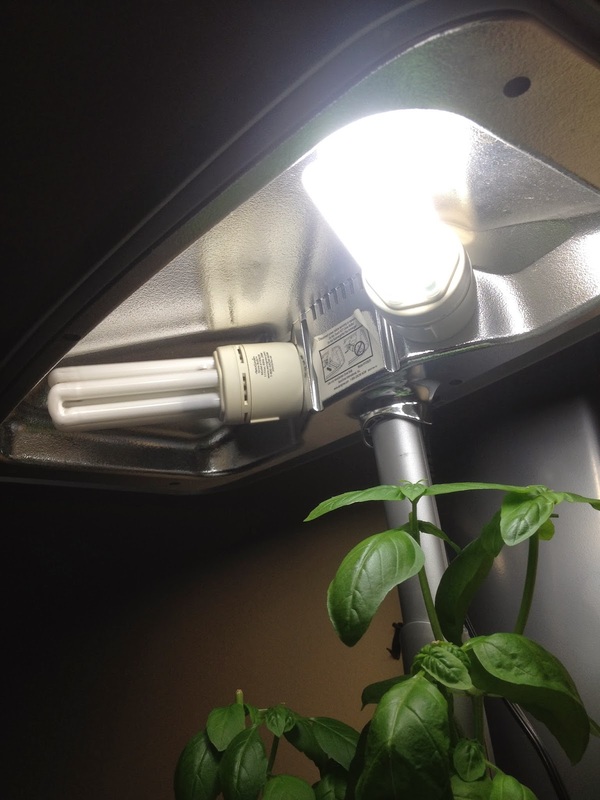 For your reference, Aerogarden replacement lights typically produce 1450 lumens of light and use 26 watts, so you'll want your CFL or LED bulb to output about the same. One thing to keep in mind is that depending on what model of Aerogarden you have, you'll need to choose between two types of light bulb sockets. Most Aerogardens that have three lights except for the Ultra, including the original Aerogarden Extra (not the "Miracle Gro" branded Aerogarden Extra), Aerogarden Extra Elite, VeggiePro, Elite+, Pro200, Deluxe, and Deluxe Upgrade Kit) use a light bulb that has more of a flat end, with two metal prongs coming out of it parallel to the shape of the light (model #100633). All other Aerogardens, including the AeroGarden 3, AeroGarden 6 (a.k.a. Space Saver and Space Saver Elite), AeroGarden 7 (a.k.a. Classic), AeroGarden Ultra, and new Miracle-Gro-branded AeroGarden Extra use a bulb that has a more round end, with two metal prongs coming out of it perpendicular to the light (model #100629 or 100340). Obviously, Aerogarden doesn't sell these on their store, but a good place to go is eBay. Just search for "aerogarden adapter" and you'll find sellers selling them for about $10-14 each; the price has gone up a little since I first wrote this post, but it's still a bargain considering the savings you'll get over time. 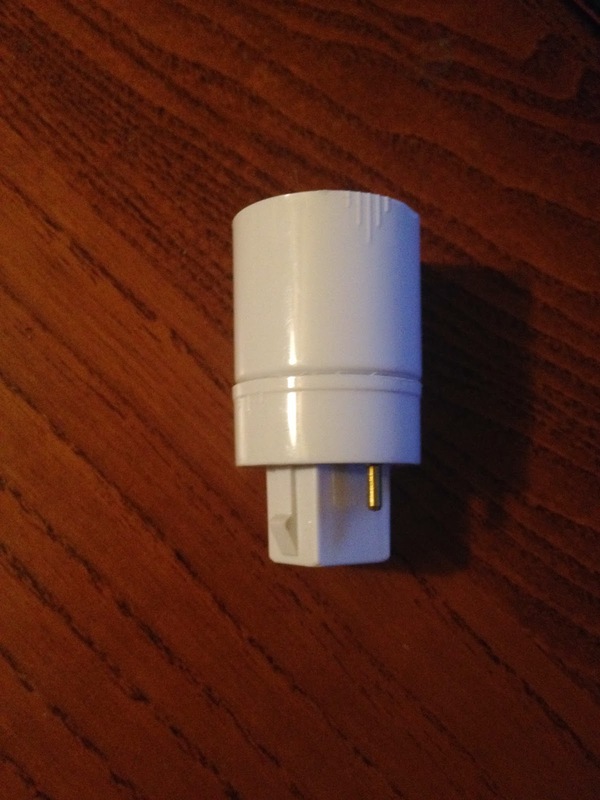 As with everything on eBay, make sure to check that the seller has a good history and great reviews, and make doubly sure that you have the adapter for the right model. The seller I used, whom I was very happy with, doesn't seem to carry them anymore, but there are certainly plenty of others that do. Just make sure you're buying the adapter that lets you use regular light bulbs in the Aerogarden, not the adapter that lets you use Aerogarden bulbs in a regular light socket. Now obviously this isn't sanctioned by Aerogarden, so chances are if you have a warranty on your product using one of these would probably invalidate it if they were to find out. On the other hand, if you're like me and have already sent hundreds of dollars of your hard-earned money to them, these little adapters are a great way to keep your gardens running. Thank you so much for your posts! I just got my first AeroGarden a few days ago, and I feel like I've learned so much from reading through your entire blog. Thanks for tip about the adapter, I hope my bulbs last at least a season. I just unpacked my Ultra, and saw your post about the upgrade! I placed my order and will await its arrival before I turn this operational. I cant find the adapter for Aerogarden Light 100633. Have any idea? I know this is an old post but I just wanted to say thank you! My Aerogarden has been sitting empty for a couple of years now because I have been unwilling to spend the ridiculous amount of money they want for the fluorescent bulbs. I mean, part of the reason I want to grow my own herbs is to save money, and with having to buy new bulbs every time the Aerogarden was costing a fortune. I saw that they now have LED models, so I decided to see if they sell a kit to convert the CFL models to LED. They don't, but I found your post, which gives me an even better solution! Thanks again! I have an old AeroGarden with bulbs that look like your top picture. I used it for the first time last year, but was worried that I may need new bulbs. However, AeroGarden no longer sells that type of bulb. Can you tell me what model of adapter you are using? I would like to get a couple for when my bulbs burn out. So...how's that "Chinese Cabbage" doing?